You're addicted to Amazon Prime? Great, me too. You are a last minute shopping? Great, me too and I have you covered. Today I am showing you all the best things that you can buy for all types of people in your life on Amazon Prime. 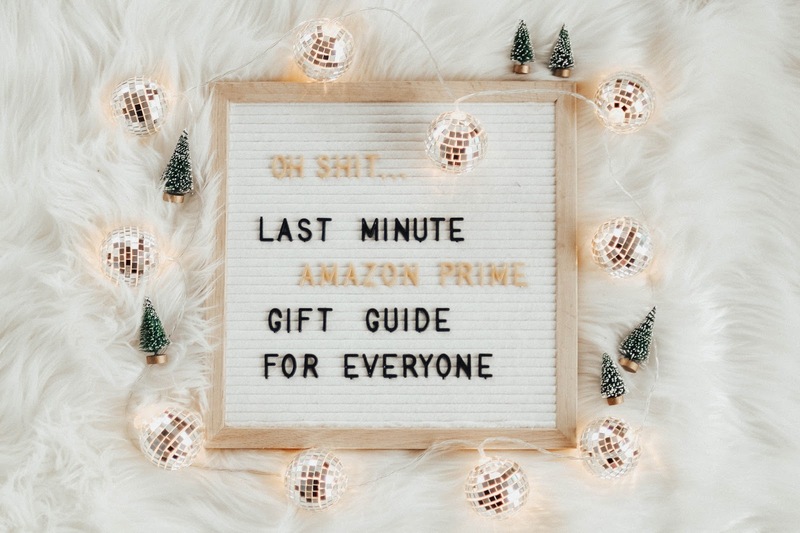 Most of the stuff I found are things you wouldn't expect to find on Amazon Prime and honestly most people probably wouldn't guess you waited to the last minute to buy these gifts... even better right? This is one of those purchases that no one would buy themselves but like how cool of an idea is this?! You can listen to your music, charge your phone and do your makeup in perfect lighting all at the same time. This is available in so many different colors but my personal favorite is the gray color that's available! These boards are super trendy right now but not really something that people would even think to put on their list because they don't necessarily "need" it. Get it! I want one! Also super trendy right now but who doesn't love a little macrame right now? This will had some boho flair to someones apartment or dorm. This is my favorite coffee table book and it came out this year so a lot of people don't have it yet! I think coffee table books are the perfect purchase for any millennial these days. Whether the person you're shopping for likes to be outdoors and needs the perfect picnic blanket, or they want a new blanket that adds a lot of color and texture to their space, I love my falsa blankets so I think these are great options for last minute Christmas purchases. Miller loves his. They are so cute and trendy right now... shocker, showing y'all something trendy. I WANT THIS SO BAD but I am one of those people who just doesn't want to buy it for myself. It's a cheaper gift but wow what a great idea for a present because now we can eat, drink, read, watch TV in the tub. Game changer. Buy someone their home state or city for their home. I wonder what Kentucky and Tennessee smells like. Boujie and unnecessary but I love my detergent. It smells amazing and makes your entire home smell delicious whenever you do your laundry. Stupid stocking stuffer but Sriracha lovers are very passionate about their spice. I love the boho look of this one and these are super affordable! Bar carts are super in these days and the tools can get pretty pricey, so why not buy someone on your list the beginners matching set. They also have rose gold versions of this on Amazon Prime too for an amazing deal. Definitely picking these up for my mom this season because they are too funny! What an adorable stocking stuffer. Someone buy me this so I can pretend to have friends and maybe actually want to drink & go out. I love champagne and how cute of an idea is this! It's like the Post Grad version of beer pong. I think these are hilarious. My boyfriend is a big "gamer" (is that what they call themselves?) These would be the cutest stocking stuffer for your gamer's stocking. A great jacket is super important in every mans wardrobe. Last year I got Cody this jacket and it's his favorite jacket to wear. It's versatile for all different styles. Ray-Bans are the best sunglasses universally speaking. My dad wears them, my brother wears them, my boyfriend wears them. Always a good go-to. Chelsea boots are great. I like them. I know Cody has new boots on his wishlist so I figured maybe some men have it on theirs too. Why is it that guys will buy themselves sneakers and not boots? I don't get it. Perfect for the immature man's humor. But really on a serious note, I thought this was hilarious so I guess I am an immature man too. Something Cody complains about is working on his Surface from the couch because the keyboard doesn't work as good from his lap because it's not a hard surface. Problem solved with something like this! Guys don't buy trendy looking things like this for themselves, so it's basically a gift for yourself because you get to look at how cute it is while the boyfriend or brother uses it to drink his coffee from. A great idea and also an thoughtful stocking stuffer for the man who is hard to shop for. Amazon has great straps for Apple Watches at such a good price compared to the Apple Store. Save your money and get more bang for your buck. So basically if your boyfriend or brother has an iPhone, get him this case. Every guy that I've met that has this case thinks it's the GOAT. Our waiter at dinner once stopped Cody when he realized he had this case because he had one too and thought it was the greatest thing. Monopoly but for the beer obsessed person in your life. Who doesn't love board games? I am obsessed with them. Not really sure how this game works but it sure does look fun! A great pick for someone still in college or early 20's... or any party person! I bought these for my brother this year because I thought they were so practical and delicious smelling. Boys don't buy nice soap for themselves like us women do. How great are these finds on Amazon Prime? Yeah, I kinda want to buy them all. There are some damn good finds on Amazon right now and I obviously had to share them with you guys! Let me know if you found any of your gifts on Amazon for this year! I would love to know what you guys have ordered on there because my guess is it will make me impulse buy... oops. Great gift ideas! Another great post! Love these ideas. So cute. My mom got me a felt board from Amazon for Christmas and I was so excited, it looks super cute on my kitchen counter! Nice post. Kanhasoft is one of the best company in USA and India providing affordable and reliable custom Amazon Seller Tools Development. Since 2012 our 45+ experienced developers delivering bug-free solutions to offshore clients from USA, UK, Canada, Singapour, South Africa, Netherland, Japan, Denmark, Norway, Australia and more.